Home › Barack Obama › Want a Bill Clinton Economy? Give the people the FREEDOM they had in 1996. Want a Bill Clinton Economy? Give the people the FREEDOM they had in 1996. JEFF ZELENY’s article is bringing more attention to what many pundits have been saying all along. 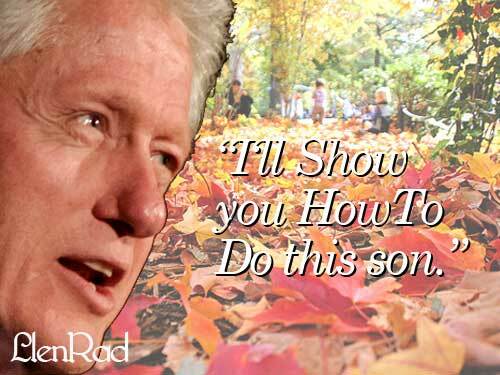 Obama needs to get Bill Clinton more involved with the campaign if he wants to be re-elected. Why? Well, it’s obvious. Most adults still remember how well they were doing back when Billy Clint was in the White House. They associate American prosperity with Bill Clinton compared to what they have seen since Obama was elected, “recessions, deficits, gloom and doom”. Any political strategist worth their weight in dirt knows this is a good opportunity to bring that “presidential Bubba nostalgia” back. Do you think people will buy it in 2012? The politicians have it better than even the weather man. Meteorologists have a reputation for being wrong and still getting paid. People still watch their forecasts loyally for some reason. Politicians don’t get the forecasts wrong they just lie. It’s as easy as that. Imagine a weatherman that customized the weather forecast based on what he thought people wanted to hear. That’s a politician for you. Eminem made a song I love the way you lie. This song really personifies my point. Maybe, people are in a state of stockholm syndrome where they have been lulled into a weird state of adoration for their abuser. Bill Clinton is loved still to this day by masses of Americans even though he signed NAFTA which was the biggest selling out of American manufacturing jobs ever. It worked perfectly for Billy Clint though because the plants didn’t start closing until years after he left office. Ask Eminem how Detroit is doing since NAFTA. Either way it goes the Clinton years are still regarded as the last days America was truly productive. This was the last 4 years in a row that the government actually had a budget surplus. Of course the 2012 congress hasn’t even passed a budget, this is their strategy to avoid a deficit. Just say there is no budget to overspend. These people are shameless crooks. Return the people the Freedom they had in 1996. Restore American freedom to the Clintonian era. End the Patriot Act and NDAA. Stop attacking people for speaking. Stop frisking people just for walking down the street in New York. Protect our money. Investigate and prosecute banksters like Ireland and Iceland. Audit the FEDERAL RESERVE, a private bank that is reported to have given 70% of tax payer bailout money to foreign banks. End Wars. American soldiers and financial resources occupied in other countries have increased dramaticly since 1996. What do you think? Will this put American prosperity back on track?